An estimated loss of 500 litres of kerosene oil. Strong oil odours and elevated PID reading in the house, most noticeably in the rear en-suite bedroom adjacent to boiler house. Field screening and analytical testing confirmed contamination to subsurface fill materials internally beneath the rear bedroom adjacent to the boiler house. Physical and analytical evidence of oil contamination identified in soils externally underneath and surrounding the boiler house and oil tank. Oil had migrated northwards along the eastern boundary wall. Oil contamination found along the foundations adjacent to the rear of the dwelling. Oily water was encountered in several sample locations across the site. The patio slabs in the work area were removed and carefully set aside. The oil tank was temporarily removed, and a temporary heat supply set up outside of the work area by a plumber engaged by Verde. The oil tank base was demolished. Furniture, clothes and built-in wardrobes in the bedroom were removed. The bathroom toilet, sink, and shower facilities in the en-suite were removed by a plumber engaged by Verde. The floors in the bathroom and bedroom were broken out and removed. The contaminated soil and fill material was excavated and removed. The walls of the extension (which had no previous foundation) were underpinned and supported with cast concrete, this work being carried out in accordance with a report and method statement provided by a structural engineer. 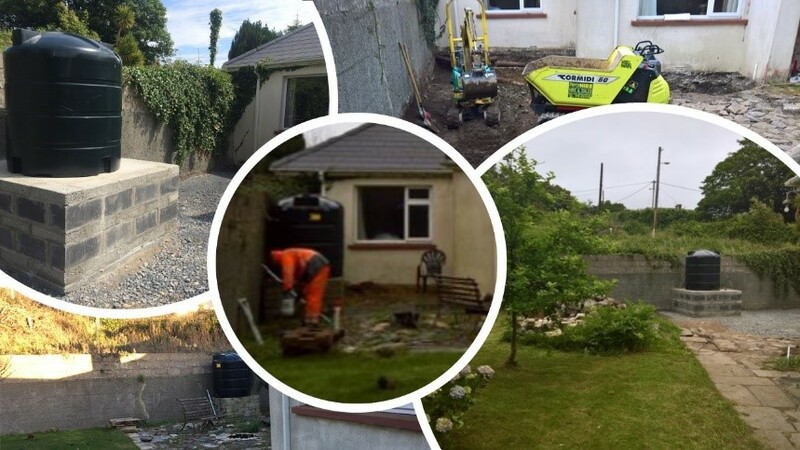 The contaminated material underneath the extension of the bedroom was excavated and removed. Sampling of the rising block work along the old house wall was carried out. Bioremediation solutions were applied to the base and sides of the excavation as part of the treatment programme. Open excavations backfilled with a granular material and compacted. Old clay pipework removed and replaced with new Wavin pipework. A new concrete subfloor poured internally and a block support wall built for the suspended floor. Installation of a new oil feed line from the boiler room to the new tank base location. A new raised block and concrete oil tank base was built externally to cater for the internal oil-fired range. Waste pipes for the sink and shower in the bedroom and en-suite were installed. New plaster was applied to the rear wall of the house. Installation of oil tank on the raised oil tank base. A final sampling exercise undertaken to examine soil quality at the previously affected areas.